Acclaimed filmmaker Ansel Faraj directs this terrifying tale of two sisters trapped in a haunted house drenched in blood and murder. With over an hour of bonus material. A modern-day haunted house story... a classic experience in terror. Two estranged sisters reunite in their ancestral family home after years away from each other. But the unspeakable horrors that drove them apart are inescapable...and what awaits them after the sun sets is terror far beyond all human comprehension. 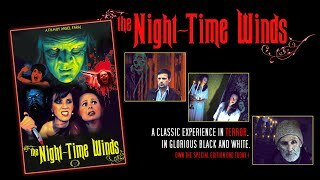 Acclaimed filmmaker Ansel Faraj directs The Night-Time Winds, an all-new horror masterpiece shot in the tradition of cinematic nightmares of years past. Fans of The Haunting and The Innocents won't want to miss this weird, macabre tale, filmed in glorious black and white.